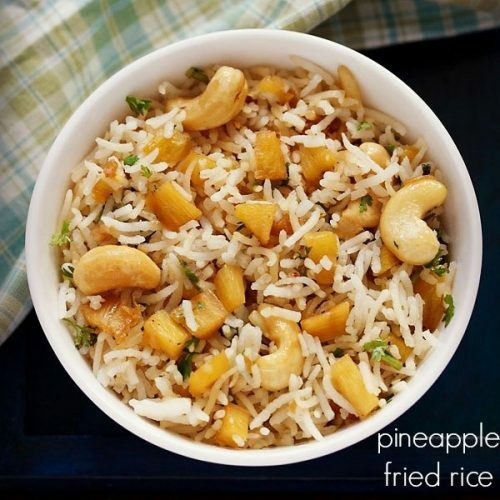 pineapple fried rice recipe - simple & delicious lightly spiced fried rice made with fresh pineapple. 200 grams basmati rice or 1 cup basmati rice or long grained rice - rinsed and then soaked in 1 cup water for 20 minutes. rinse rice very well till the water runs clear of starch. soak rice in water for 20 mins. drain and keep aside. in a pot, bring to a boil 4 to 4.5 cups of water with 1/2 tsp salt and 1/2 tsp oil. while straining, you can also gently rinse the rice in water so that they stop cooking and don't stick to each other. you can also fluff the rice with a fork and keep aside. cover the rice and keep aside till the rice cools completely. when the rice is soaking, prep the other ingredients. peel and chop the pineapple in small cubes. also chop the other ingredients like onion, green chilies & garlic. heat 2 tbsp oil in a kadai or wok. add 1/3 cup finely chopped onions. spring onions can also be used instead of onions. on a low to medium flame, saute for a minute. add 1 to 2 green chilies or red chilies (chopped or sliced), ½ tsp finely chopped garlic and ½ tsp finely chopped celery (optional). stir and saute for a few seconds. then add ¼ cup cashews. saute for 3 to 4 minutes till the cashews become a light golden or golden. stir and saute the pineapple cubes for 4 to 5 minutes till the moisture dries up. you can also saute the pineapple cubes till they caramelize. add freshly crushed black pepper. stir very well. add 1 tbsp naturally fermented soy sauce. you can add soy sauce as per taste preferences. mix well. add ½ tbsp red chili sauce or sriracha sauce. you can add more or less as per your taste. mix the sauces very well with the rest of the ingredients. add the cooked rice. season with salt. stir gently and mix the rice very well with the rest of the ingredients. saute for 2 to 3 minutes with occasional stirrings. lastly add 3 tbsp chopped coriander leaves. you can also add 2 tbsp parsley leaves instead of coriander leaves. stir well. serve pineapple fried rice plain or with stir fried veggies.